Russian President Vladimir Putin has passed a test of a new hypersonic missile, declaring that the weapon is impossible to intercept and will guarantee the country's security over the coming decades. Speaking to Russia's top military brass on Wednesday after watching the said the test was a "great success" and an "excellent New Year's gift to the nation". According to the Kremlin, the missile was launched from the Dombarovskiy missile base in the southern Ural Mountains and hit its target on a test site in Kamchatka, about 6,000km away. "The Avangard is invulnerable to intercept at any existing and prospective missile defense means of the potential adversary, "Putin said after the test, adding that the new weapon will enter service next year with the military's Strategic Missile Forces. 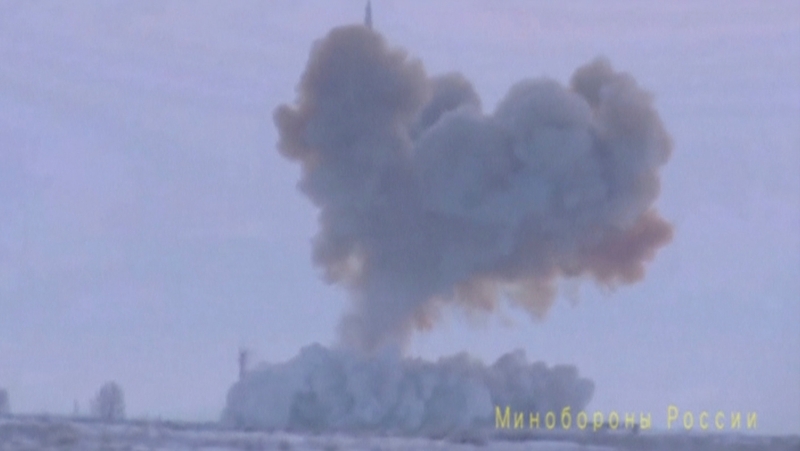 The hypersonic missile was among the Array of new nuclear weapons that Putin presented in March, saying that Russia had to develop in response to the development of the US missile defense system that could erode Russia's nuclear deterrent. When first presenting it, the Russian president said the new missile system has an intercontinental range and can fly in the atmosphere at 20 times the speed of sound, adapting the enemy's missile defense. Putin has said that Avangard is designed using new composite materials to withstand temperatures of up to 2,000 degrees Celsius from a flight through the atmosphere at hypersonic speeds.